Hello everyone it’s me candle. 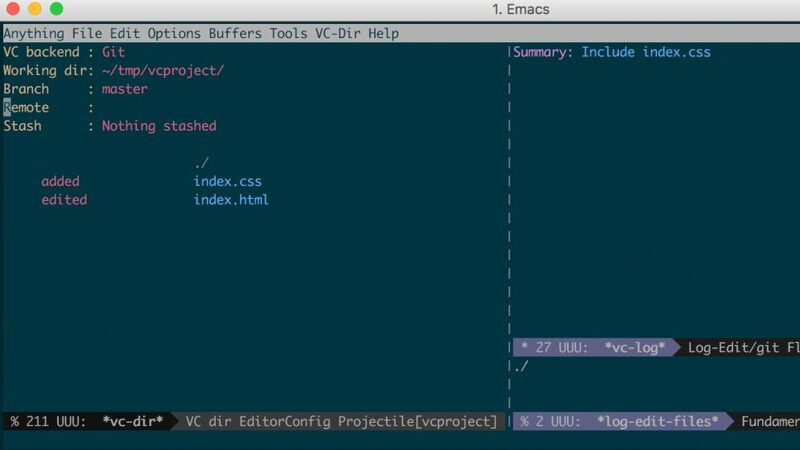 In this article we would like to use vc(version controll) which is included by deault in emacs. 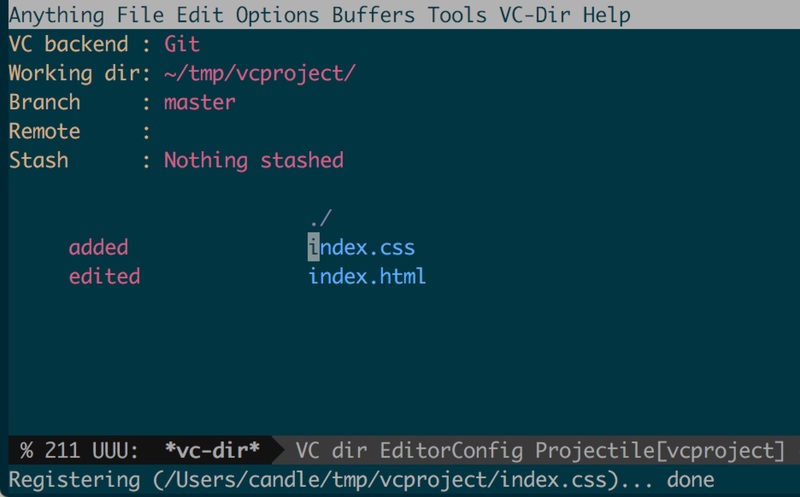 It seems that vc supports to both subversion and git, not git-specific functions. 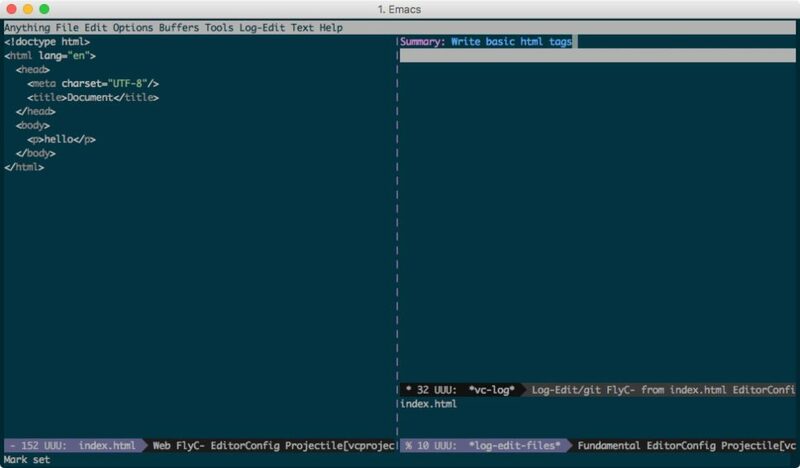 If you want to use git with emacs in earnest, I recommend magit. On the other hand, since vc is installed in by default, it is good for user who want to use it easily. You have a basic git skill. 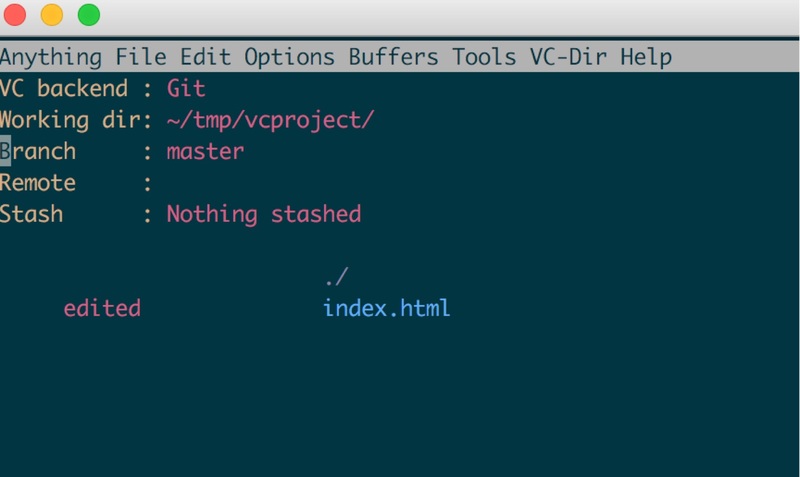 Although vc supports to git, ‘git add’ and ‘git reset HEAD’ do not exist. I do not know why, but perhaps it seemed to be trying to accommodate both git and subversion. Since it is hard to use it, let’s add some settings and make it usable. 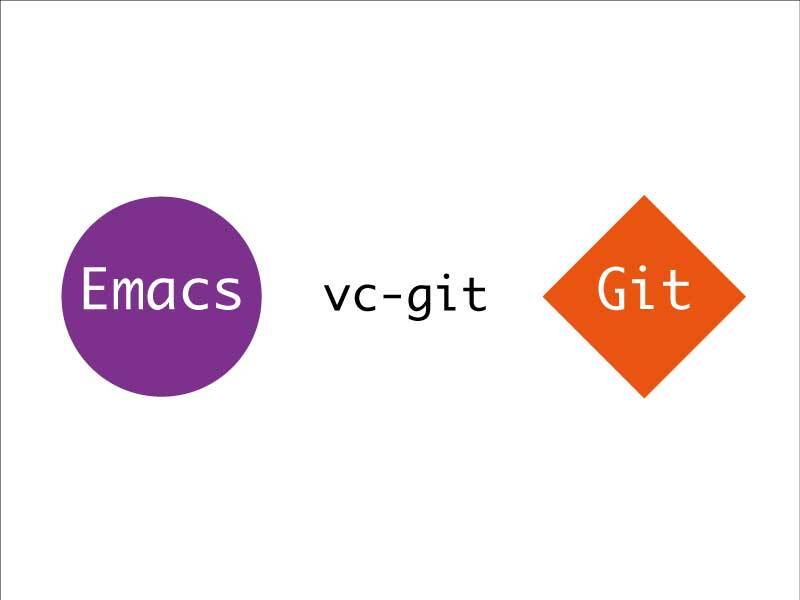 The setting was referred to the following article introduced from the official vc git formula. However, the code written in the article did not work well on emacs 25, so I edited it a bit of work..
Open the emacs configuration file. 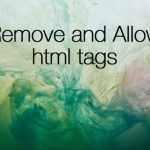 We create a something folder and create index.html in it. OK we created the git repository which has only index.html. Open the index.html with emacs and write this and save it. Currently, you keep to open the index.html, try to display the difference of this file. Run following command or type a short cut. 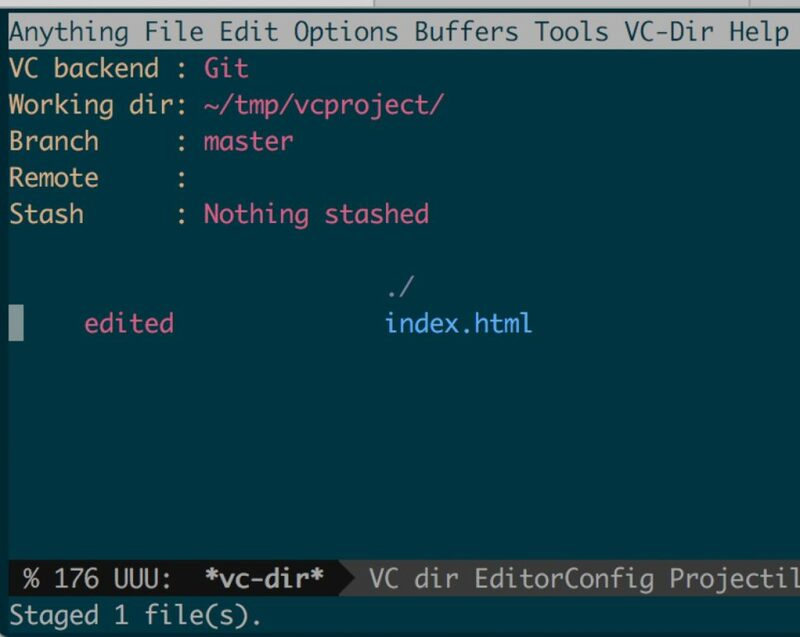 The command which is same as ‘git status’ is vc-dir. You execute this command, you can see the whole of changes under the repository. Now, you can see that tags were added to index.html. You will be asked in which directory git differences to display. You can find out the what changes were made. Move the cursor to the in front of file name, push the enter, you can move to that file. 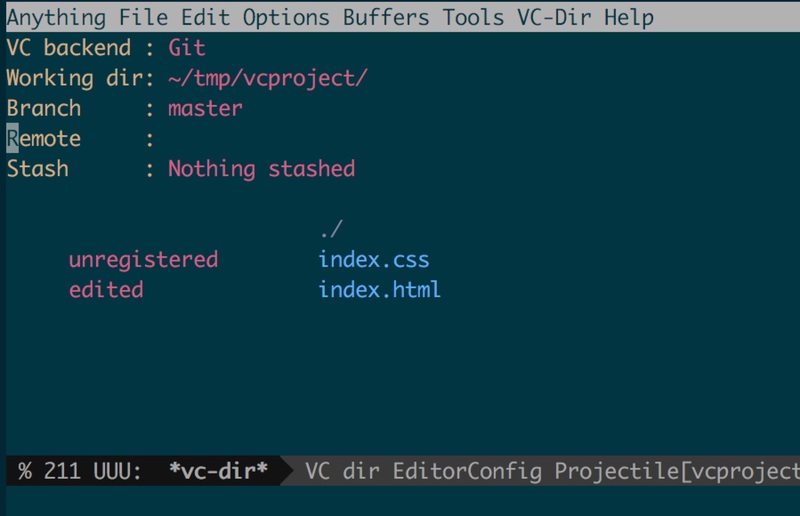 As I wrote before it, vc git doesn’t support ‘git add’ by default. but you can use it by above setting. There are two ways to ‘git add’. Open the changed index.html file, run the following command. Another way is do that from the vc-dir window. Move the cursor to the file you want to move to the index stage and execute the following. Or just type “a” in front of the file name to ‘git add’. If you run ‘C-x v a’ around above the file name, all of the differences will be added to the index. Unfortunately, you can’t see either the file is at index or not in emacs. So you need to run git directly with CUI, or use another gui tool such as gitup. 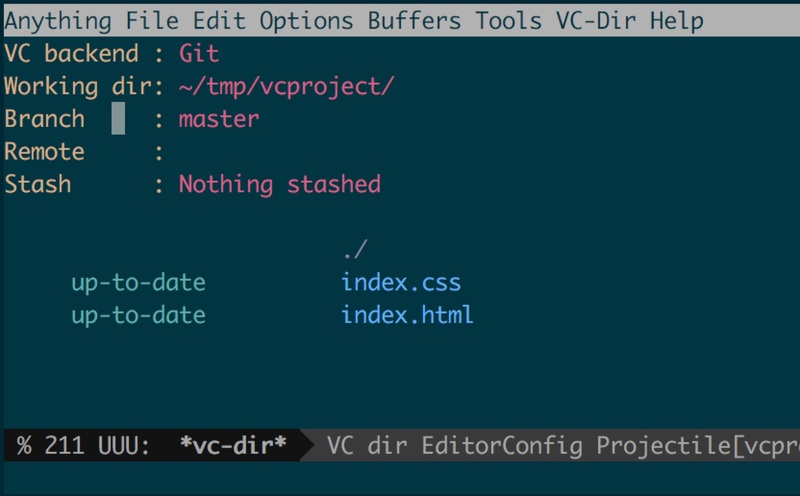 This is a confusing part especially when using git with vc. When creating a new file, vc `git add` the file with vc-register function. 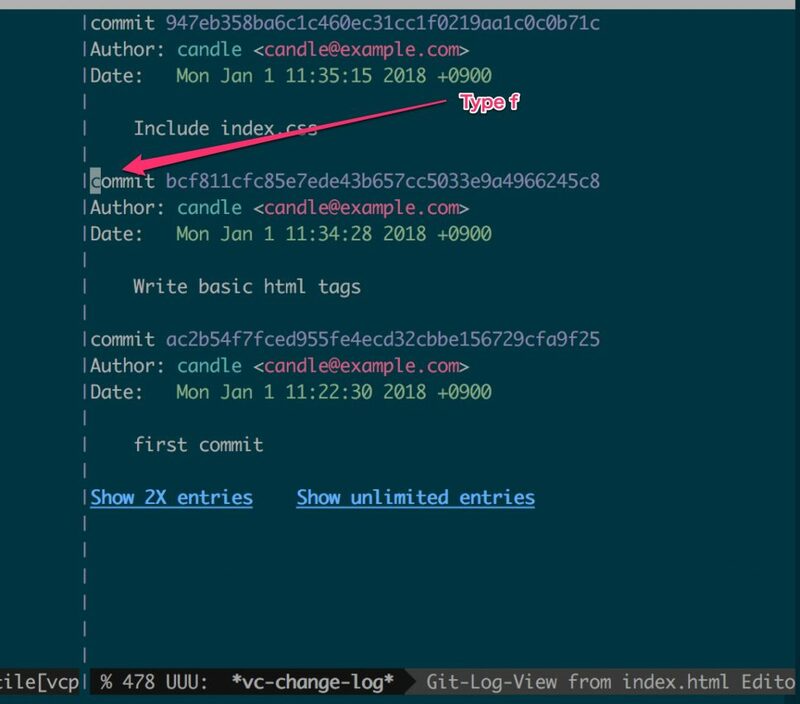 However, this ‘git add’ command is used only when a new file is created, and if you want to ‘git add’ the difference of already existing file, use my-vc-git-add. 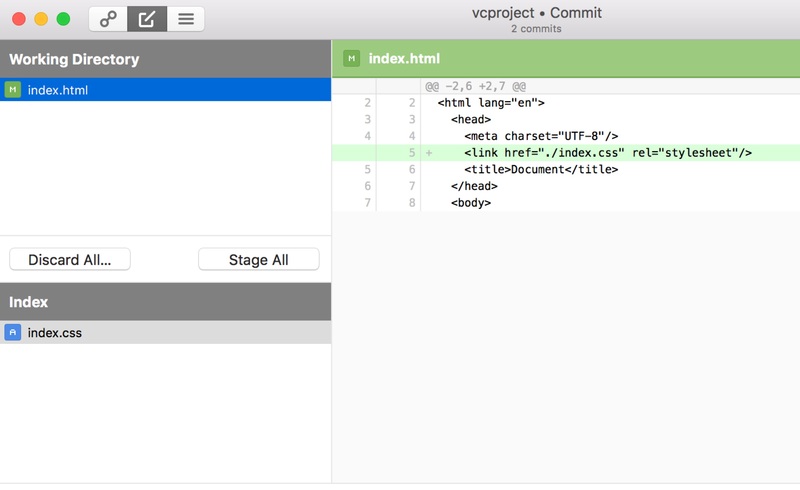 Conversely, even if my-vc-git-add is added to a new file, it is registered in index stage on git, but it can not be committed because it is not registered on vc. To summarize, once you create a new file, use the vc-register function. Create index.css as a trial. 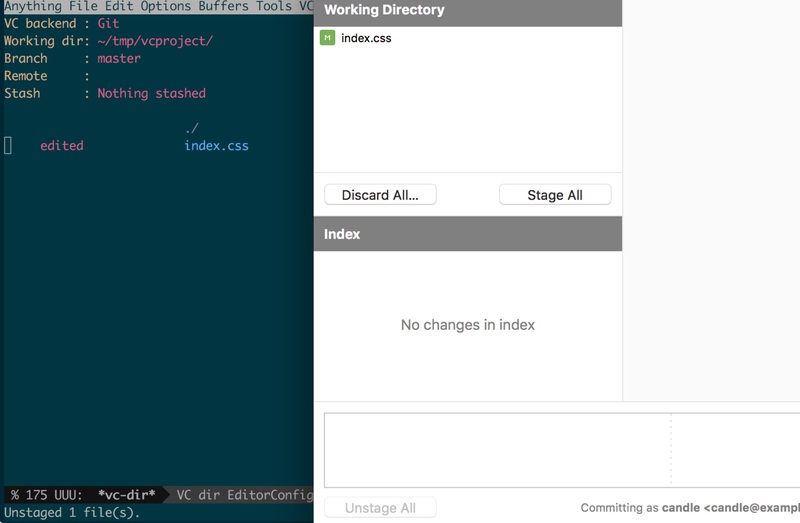 By running vc-dir, you can check the two states, index.html and index.css. You can see the index.css status would be ‘unregistered’. Move the cursor in front of ‘unregistered’, execute ‘vc-register’. The status became to ‘added’. 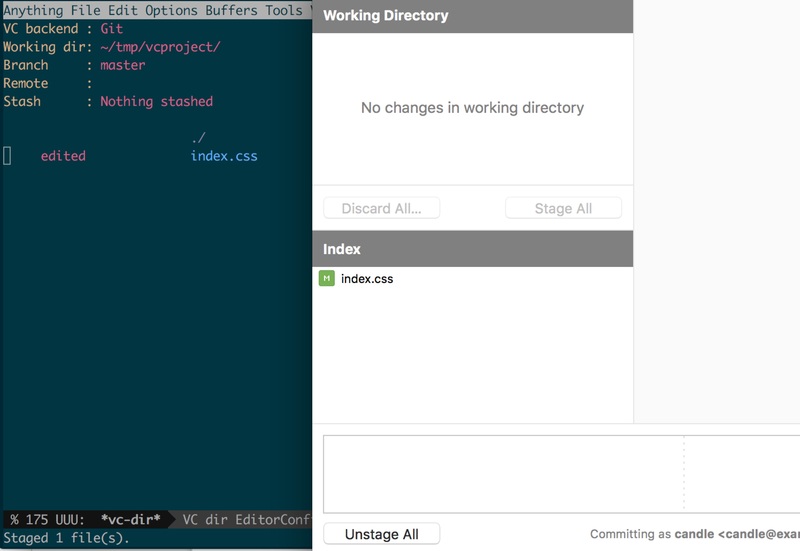 It is “git add index.css” in git. Also there are two ways to commit. At first let’s commit each buffer. vc-next-action can commit a buffer even if buffer is not added to index stage. As in the above image, if there are differences of multiple files, you commit from the buffer, only that buffer will be committed. 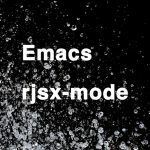 Display index.html in emacs and run this. Insert a commit text into the place of “Summary”. Type C-c C-c and then it’ll be committed. Of course, as a large-scale application, I think that cases to change only one file and commit will decrease. Next we try to commit whole of changes in repository. 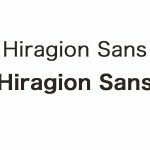 Edit index.html to include index.css. The current difference is index.css newly created and index.html with description to include it. If you want to commit whole of repository, you need to execute it in vc-dir mode. Be careful a location of cursor. 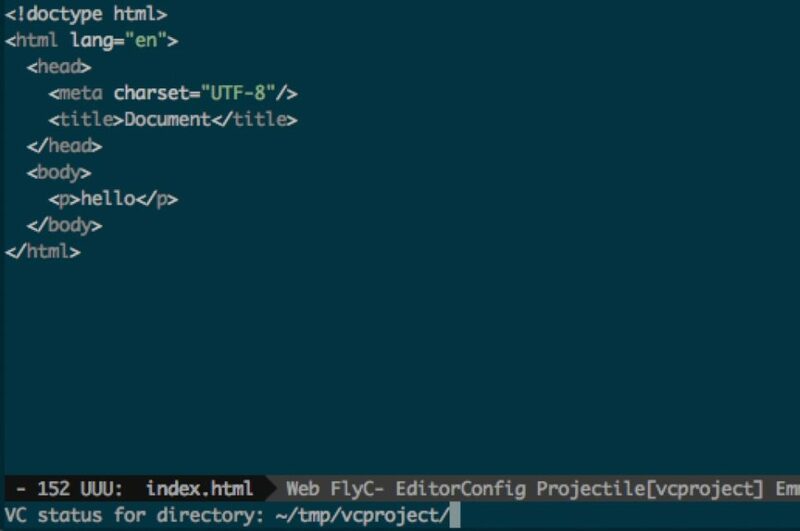 Don’t put the cursor in front of file name and execute vc-next-action because only that file will be committed. So you should put the cursor around these places and execute it. 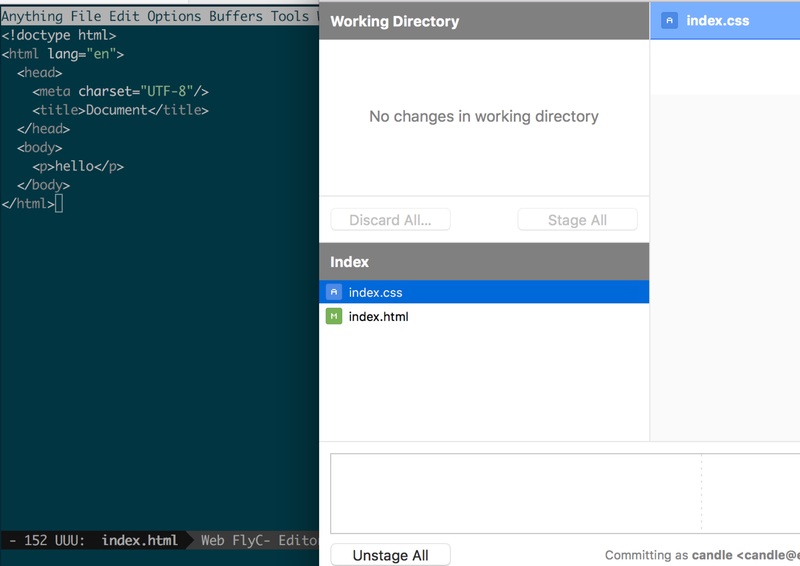 Open the index.css and write styles. git add the edited files. In the same way, place the cursor in front of the file and execute the following. 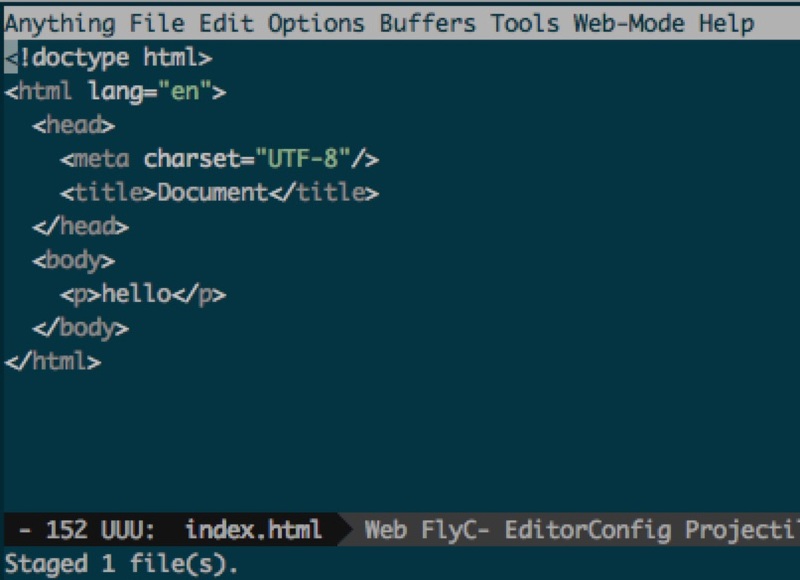 Or you can unstage by typing “u” in front of the file name. It is “git checkout index.css” in git. You can deleteit in two ways. First we do it on the buffer. 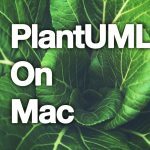 Display the file whose you want to delete change in emacs. It asks you really want to delete the difference, so you type yes or no. If you type yes, difference is deleted. 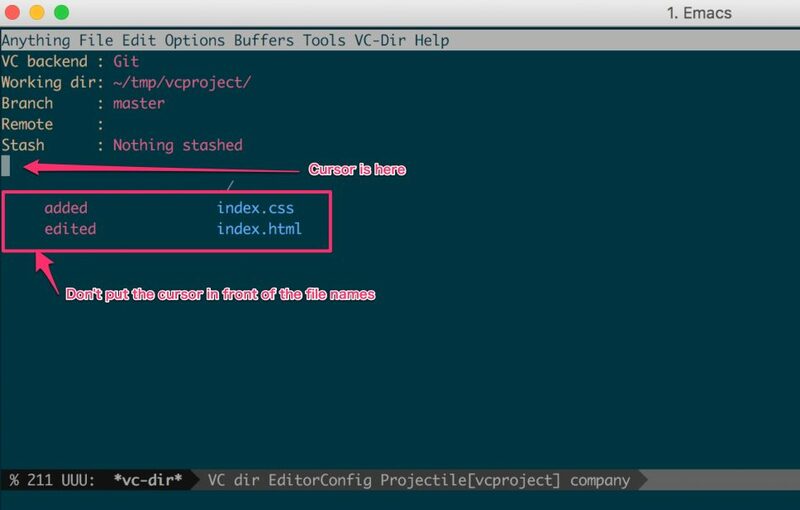 To delete a change from vc-dir, execute the following in front of the file name you want to delete. For example you want to see the index.html log. Open the index.html with emacs and execute this. 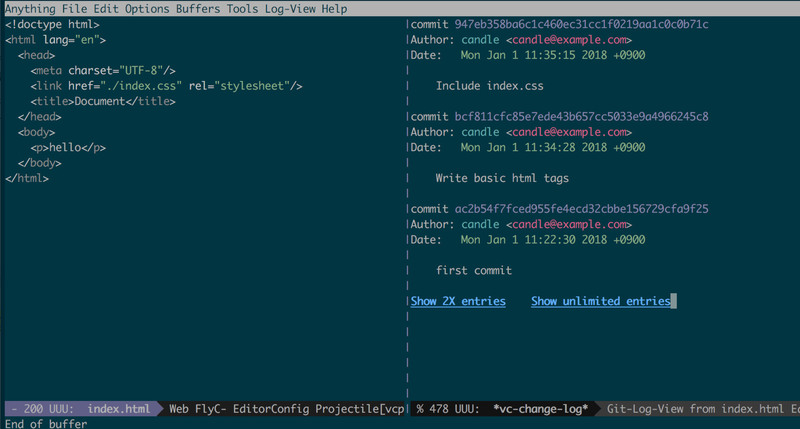 By pressing the f key in the commit hash part in the history, you can check the file at the commit time. Although this file can be seen, there is a problem that if you see these files, past files are created in the same directory. To see the history of the repository, execute the following command. I summarized the basic usage of vc git. Of course, I think that it is better to use”magit” for who want to use seriously. 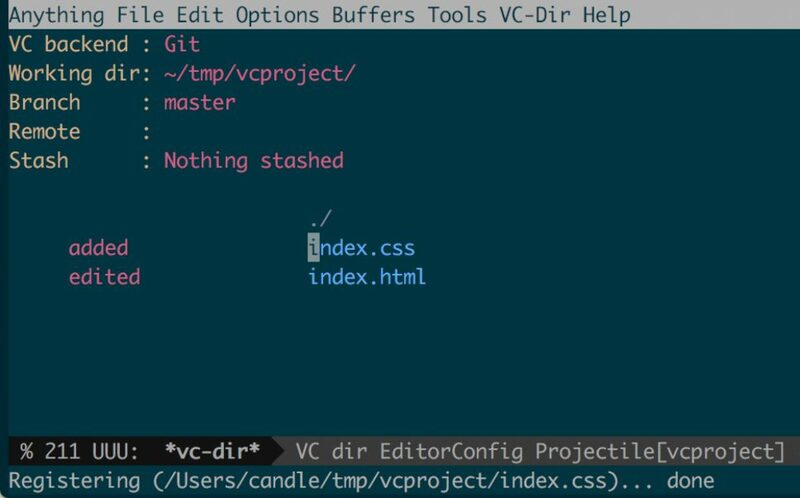 However, I think that vc git is convenient. Abstract Hello everyone it’s me candle. In this time we would like to use the login hook of Mac and automatically allocate the local ip address. 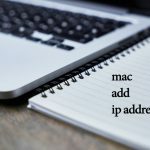 You can use the default 127.0.0.1 lolcal IP address on your Mac. However when using it with docker, you need to prepare other local IP address separately. Precondition You use Mac. Abstract Hello everybody it’s me candle. 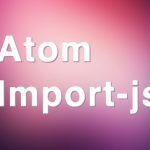 In this time we will import the component path into the file using import-js and Atom automatically. 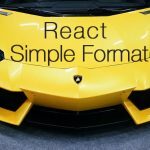 React recommends to write one component in one file, when development becomes to be big, the number of component increase. If you use 10 components with one Container, you need to write 10 import statements. 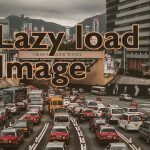 import-js helps us from such troublesome work. 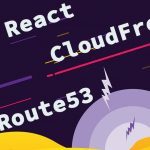 Precondition Already exist React web environment I recommend you use the react project created by create-react-app command which I wrote the before article. 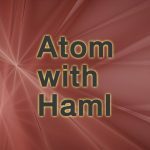 Atom was installed in your computer.